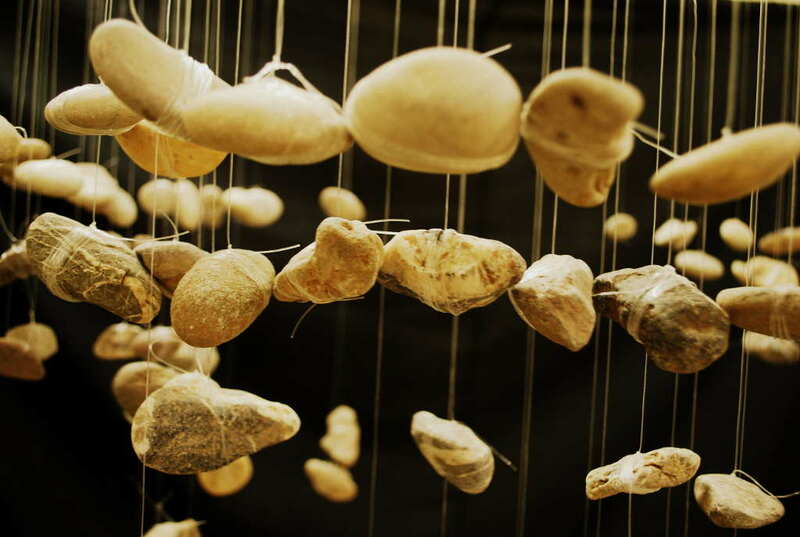 Lucid Moments – one of the art works, a 3D installation, I created during my time in National College of Arts, my present university – is a representation of how life is just a sum total of moments frozen in time. These are the moments when ambiguities become clear and stand out in life as defining experiences. The moments that came to my mind making this artwork was when I was in my high school and I was deciding what subjects to take. I had never experienced exploring colors on canvas. I looked on as the teacher demonstrated shading a portrait using 6B shading pencils, how the darkest colors would require the darkest shading, she demonstrated her shading techniques and got me hooked on to her subject as I watched mesmerized the magic of a solo pencil. That day, I knew that this moment would define who I would be for the rest of my life. The pebbles were collected from various dams in Pakistan. They show the moments I have experienced,the good and bad. The fish wire used depicts my life-line and identity. This work is to date exhibited in National College Of Arts. It is around 8ft in height. I am Fatimah Manzar, currently enrolled in National College of Arts. I have chosen to pursue one of the most diverse and dynamic career paths which resonates strongly with my creative impulses. I would say with certainty that I was created to dwell and live in arts.